The simplest method is retracting the skin with retractors, grasping the fascia with Kocher's clamps, and suturing it with sutures. However, external suture of 1 cm port-site incisions may be extremely difficult especially in the obese population. Several specialized devices for secure port-site closure have been introduced (10-13). The Carter-Thomason Needlepoint Suture Passer™ h consists of a 10-mm metal cone that has two cylindrical openings located diagonally opposite each other. The Carter-Thomason needle grasper is used to insert one end of the suture loop through one of the cylinders within the cone, thereby traversing the full thickness of the abdominal wall. The end of the suture within the peritoneal cavity is grasped with a 5-mm grasper via one of the other ports by the assistant. The Carter-Thomason needle grasper is reintroduced through the diagonally opposite cylinder of the metal cone. The intraperitoneal end of the suture is fed to the needlepoint grasper and pulled out of the abdomen. The metal cone is slid off both ends of the suture. 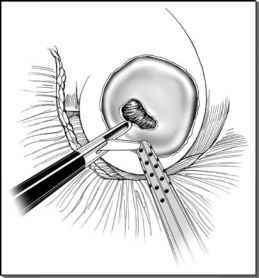 Subsequently, the suture is tied after desufflating the abdomen to provide adequate fascial closure. Alternatively, the Carter-Thomason needle grasper may be used without the cone using finger guidance. In general, it is our recommendation to close all 10 mm or larger port sites.